Last night after watching a lot of home reno TV that made me feel a lot more competent about how I look after this place, I set down my knitting and walked away and then stopped. H'mmmm, I thought: somebody might hurt themselves on that. 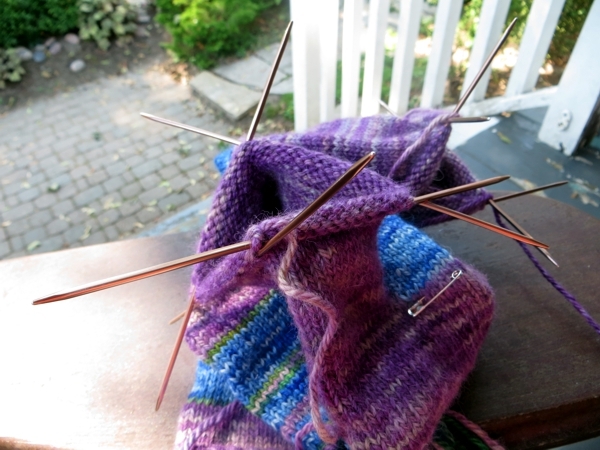 When you have two socks going at once, and the yarn is thick enough and knit dense enough for the double-point needles to stand on end, that's porcupine knitting. And yet when you smooth them all out they look quite civilized. Plus: close to being done, YAY. I must say I am loving the way these are coming out. I know 'mohair' doesn't suggest 'silk' on the smoothness front, but these babies are coming out like little twin heavens for feet. 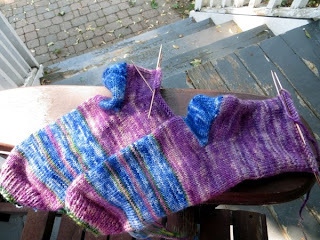 And even though I have several friends who love purple and would be very very happy if I was knitting these socks for them... nope. Still greedy here; they're for me. Aren't the stitches just so pretty? Less pretty but growing on me as a shabby chic thing: the distressed wood look on the porch. Further to the whole home reno thing - perhaps you've been watching the paint slowly wearing away over the last few years of photography here? I know I have. For a variety of reasons we decided to just let it all go till our beloved contractor could come back and rebuild the whole package. So: just in case you love the shabby effect, you will probably want to know that unless something terrible happens, he's coming next week. Fingers Crossed. 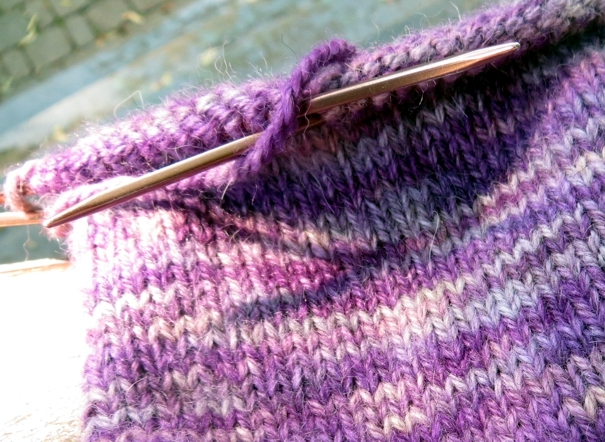 But not too crossed because I need those fingers for knitting the rest of these socks. Hope you've had a great day and I will see you tomorrow! Lovely socks! I've always got a pair or two on the needles. One can't have too many pair of hand knit socks!